Reverse Polymerization (RP) is the reduction of organic material through the application of microwave energy in an oxygen-depleted (nitrogen-rich) atmosphere. Microwave energy is absorbed by the organic material, causing rotation of inter-molecular bonds, leading to the generation and emission of narrowband infrared energy. The narrow band infrared energy is re-absorbed by surrounding material, increasing the amount of energy in the bonds until the bonds break. The breaking of the bonds results in the conversion of complex organic compounds into simpler compounds of lower molecular weight without undergoing oxidation. Application of microwaves occurs in a nitrogen-rich environment (oxygen depleted). Therefore, oxidation of the waste does not occur. Reaction occurs at relatively low chamber temperatures of 150º C to 350º C, depending on the application. 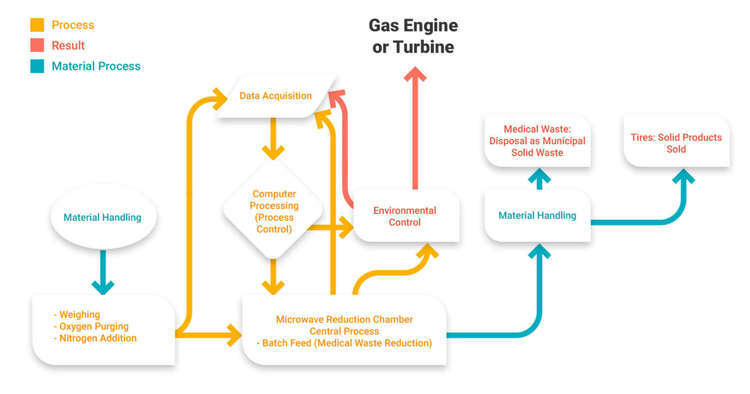 Control of the process is more precise as the microwave energy is focused and the energy input is variable, allowing the desired amount of energy input per unit mass of waste to be applied. Reverse Polymerization is not incineration, which is an oxidation process that occurs at higher temperatures. Oxidation of organic waste materials can lead to the formation of undesirable by-products such as dioxins or furans. Reverse Polymerization is not pyrolysis, which is generally conducted at higher temperatures and which heats from the outside in. Neither incineration nor pyrolysis can be precisely controlled in the same manner as Reverse Polymerization. Less controlled reactions lack the ability to control the composition and quality of the end-products. This has major implications in the scrap tire application and is one of the reasons that EWI’s RP process creates such high-quality byproducts from tires.